Different than the traditional auction sites like eBay, pay-per bid sites are auction sites where you pay for bids and compete against other bidders for deals on all sorts of products and merchandise. These pay per bid sites work by charging you for bids and then you use these bids to try and win an auction. If it sounds confusing, we have a detailed guide on how penny auctions work that you can read through to learn exactly how bidding sites work. All of the penny auctions listed on this site are essentially bidding sites. Meaning that users (you) have to purchase bids in order to place a bid on an auction. For example, if you purchase 100 bids at $.50 per bid then you have spent $50 on bids. These 100 bids are now in your bidding bank and you can bid on an auction (or auctions) 100 times without spending any additional money. If you win the auction then you have the chance to buy the item at it’s auction off price which is normally way below the retail price. However, if you do not win the auction and someone outbids you then you lose the money you spent on the bids with nothing at all to show for it. If you bid 10 times trying to win an iPad at a bidding site and someone outbids you then you have essentially spent $5.00 worth of your bids, assuming $.50 cost per bid spent, with out winning the auction. The bidding site itself now has that money to offset the price of the item that is up for bid. So, the bidding sites are interested primarily in how many bids an auction receives as that amount determines the amount of money that they earn for the item they are selling. If there is an item that costs the bidding site $50 to purchase then at a minimum the bidding site wants the auction to run for at least 100 bids so they can re-coup their cost of the item being sold. 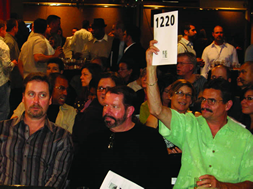 They do not care if who spends the bids as long as the bids are spent by all bidders on the particular auction. They also do not care who wins the auction as it does not really effect their business. Online bidding sites are in the business of selling bids, not products. Remember that one rule and you will have a good understanding of how bidding sites work. As mentioned above, bidding sites are a whole different animal than the traditional auctions you may be familiar with. The biggest gotcha that new players to the bidding site arena is that there is a real possibility of loosing money. If spend some of your bids on an auction and you do not win that auction then you have lost that money. It is gone, you do not get it back even if you do not win the auction. This is a common error of bidding beginners of penny auction sites. Compare this to a traditional auction model like ebay and the loosing bidders do not pay anything since they did not win the auction. Bidding sites and penny auctions are a game, and a very competitive one.